The American Institute of Architecture Students (AIAS) is proud to announce a new partnership with the Modular Building Institute Educational Foundation (MBI), the Voice of Commercial Modular Construction. “The AIAS has long served its membership by providing them with the resources and relationships necessary to empower them to enter the workforce as innovators, and equal partners in developing a greener, smarter, and better tomorrow. We’re proud to partner with the MBI Educational Foundation to advance that mission, and to celebrate the resilient and adaptable future tomorrow’s industry leaders will bring into reality,” said Charlie Klecha, interim executive director of the AIAS. In 2019, the MBI Educational Foundation will be sponsoring the AIAS In Studio Model Competition, which launched on February 15th. AIAS members are asked to share their models to highlight their studio work and to provide inspiration for those looking to enhance their own skill sets. This year, a new element has been added to the competition, a focus on commercial modular construction. 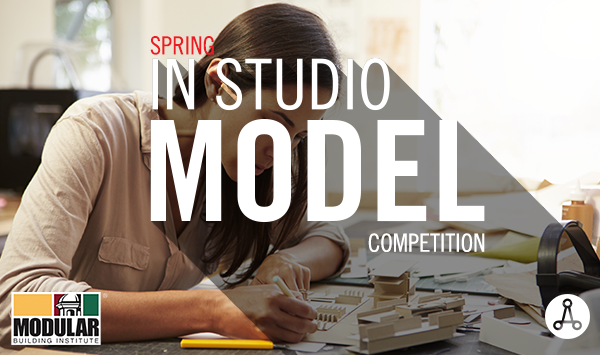 The In Studio Model competition is open to students of all years and skill sets, which makes it an attractive competition to the AIAS membership. The first place winner will receive $500, with second and third place winners taking home $250 and $100, respectively. Last year’s winning entries can be viewed here. “The MBI Educational Foundation is extremely excited to be working with AIAS and its members. Our educational resources already include things like online courses, a college textbook, conferences, and classroom lecturers; but this is the first time we have conducted a design competition over social media. What a great way for students to showcase their ideas on innovating construction with a process like modular building that has proven time and time again to be greener, faster, smarter,” said Steven Williams, executive director of the foundation. Join us at AIAS Grassroots Leadership Conference in Washington, DC July 18-21, 2019, to meet and hear more about MBI’s Educational Foundation and its programs. The conference is a platform to discuss chapter leadership and business leadership, community involvement and innovation. Attendees can learn from local CEOs, founders, government officials and professionals.